As mentioned previously, El Segundo sworn firefighters, from lowest level Firefighter up to the Fire Chief, are by far the highest paid city employees. Generally, sworn police officers from lowest level Police Officer up to Police Captain are a close second. As we shall see, the Police Chief was by far the highest paid city employee in 2009. The third 3.75% raise is not reflected in the 2009 Total Earnings. In addition, half of the second 3.75% raise is not reflected in the 2009 Regular Earnings and Overtime Earnings. This second 3.75% raise is not reflected in any vacation and sick leave hours cashed-out before July 1, 2009. Therefore, all of the 2009 firefighter compensation data is an under-representation of the current firefighter compensation under the current firefighters union contract. 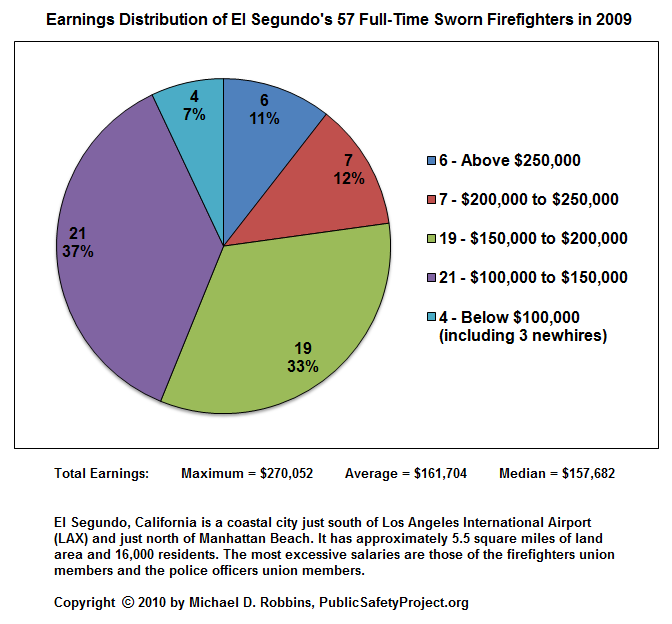 The El Segundo, California sworn police employee total earnings statistics are given below for 57 full-time sworn firefighter employees in calendar year 2009. The 2009 total earnings includes Regular Earnings, Special Compensation, Overtime, and Leave Payout (vacation and sick leave combined), but excludes CalPERS pension contributions, 401(a) deferred compensation contributions, and city-paid health insurance, life insurance, and any CalPERS pension income received while working during the same year. 53 (93%) earned more than $100,000. The sworn firefighter ranks, from lowest to highest, are: Firefighter, Fire Engineer, Fire Captain, Battalion Chief, Deputy Fire Chief (position eliminated in 2010 with the early retirement of Deputy Fire Chief Eric Moore), and Fire Chief. Firefighters with Paramedic training and certification get additional pay whether or not they are assigned to Paramedic duty. Fire Captain and below are members of the El Segundo Firefighters Association, which is just a fancy name for the firefighters union. Battalion Chief and above are management. The sworn firefighters work on duty on a 48-hour shift, and then are off-duty for 96 hours, i.e., for four full days. As a result, commuting to and from work is not an issue, and only a few firefighters live in the city. They can live far away where land and homes are considerably less expensive than in the city. Also, they have plenty of time off from work to have a second job or run their own business. Alternatively, if their buddies call in sick or take vacation leave, they can be called in to work and get paid the overtime rate, which is one and a half times their already excessive regular pay rate. There are three 48-hours shifts: A-Shift, B-Shift, and C-Shift, with one Battalion Chief for each of the three shifts. There may be a fourth Battalion Chief, an Administrative Battalion Chief who works a regular 40-hour work week, or the administrative duties may instead be performed by an Deputy Fire Chief (position eliminated in 2010). For each 24-hour day of a 48-hour shift, the firefighters are paid to sleep for 8 hours, but must respond to emergency calls, if any; they are paid to be on call for another 8 hours; and they are paid to work for 8 hours, where they perform equipment cleaning and maintenance, and other duties, when they are waiting for an emergency call. Because firefighters have four days off at a time, i.e., a 6-day week including a 4-day weekend, they do not have to take much of their vacation or sick leave hours to have time off, and they are allowed to accrue, accumulate, and roll over from year to year huge numbers of leave hours that can be later cashed in after pay raises at a higher pay rate. This entry was posted in California, Doug Willmore's Great Chevron Shakedown, El Segundo, El Segundo News, Firefighter and Police Union Compensation and Pensions, Firefighter Union Corruption, Government Employee Compensation and Pensions and tagged city, data, El Segundo, El Segundo Firefighters Association, ESFA, fire union, fire union corruption, firefighter compensation, firefighters union, local government, union corruption. Bookmark the permalink.